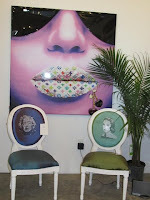 The boutique is quite lovely and very inviting. In addition to apparel, shoes, and accessories you’ll find unique furniture and art work. 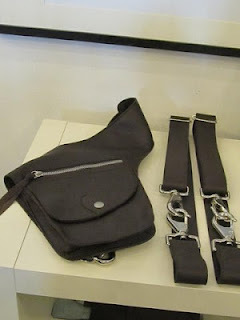 I was happy to see that one of the featured designers was Bagstil, which also includes bits. and CO-ZY. 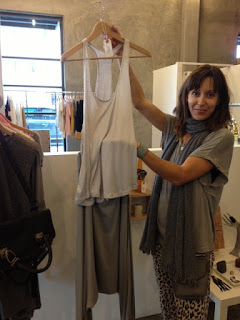 Designer Cindy Gellersen added a few new pieces to the CO-ZY collection – a pair of relaxed harem pants and a super soft tank. There were some cool new belts in the b.i.t.s. line that are the perfect accompaniment for her saddle bag pouches. You’ll also find an array of chic leather jewelry and fabulous handbags. The craftsmanship of these pieces is superb. I also had the opportunity to chat with Caius Olow – chief creative officer/designer for 020608 Tears of Bleu. Caius has extensive experience in fashion – including the design and manufacturing of denim. His 020608 Tears of Bleu collection focuses on stylish denim jeans for men, women, and children. The line garners its edge though the influence of classic British tailoring. Caius is in the process of opening his own boutique and plans to launch a premium clothing line in the near future.